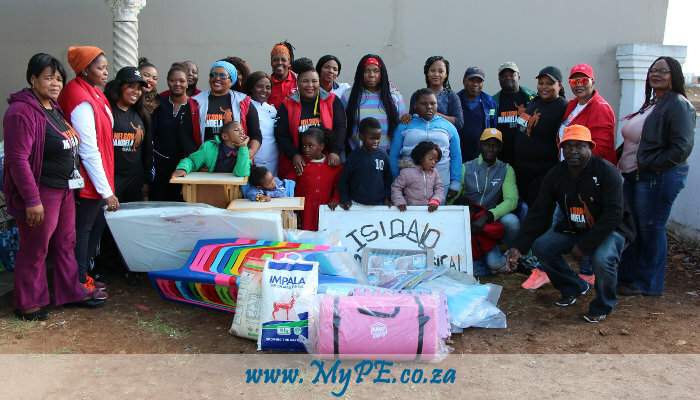 The Port of PE employees visited three organisations to hand over donations, including Licebo School in Ikamvelihle, a learning centre for children with special needs. Employees from Transnet National Ports Authority (TNPA) heeded the global call to mark Nelson Mandela International Day and the centenary of his birth by being of service to others. This year TNPA once again encouraged employees who volunteer for causes in their personal time, to nominate organisations they wished to support through the company’s Mandela Day activities. TNPA’s activities impacted 17 charitable causes ranging from youth centres, schools, children’s and old age homes, palliative care organisations, informal settlements and more. In Port Elizabeth the team of volunteers observed the day at three facilities close to employees’ hearts. They visited the Licebo School in Ikamvelihle, a learning centre for children with special needs, Khanyisa Isibane Edu-care Centre in Missionvale, a centre for children whose parents cannot afford pre-school, and Yokhuselo Haven, a centre that provides care and support for abused women and children. The teams provided donations such as tables, chairs, teaching aids, 49m2 containers to be used as classrooms, groceries, toiletries, sanitary pads, blankets and they also cooked and cleaned the premises. Staff from TNPA’s Johannesburg head office – including some of the national executive committee – spent the day at Chris Hani Baragwanath Hospital’s Burns Unit Paediatric Ward. Thirty-one volunteers cleaned, landscaped the premises, fed the children, donated pyjamas and distributed blankets. They also treated the children to storytelling, a special Mandela Day cake and a visit from one of their favourite cartoon characters, Mickey Mouse. A team of 70 volunteers from the Port of Durban chose to be of service to the Sparks Estate Cheshire Home in Sydenham. The home provides residential care for 48 differently abled children and adults including those with intellectual disabilities. The activities for the day included refurbishments of the boys’ bathroom facility, spring cleaning inside the facility, gardening, re-painting and organising the Edu-Centre, re-painting of the gutters and down pipes and replacement of the jungle gym structure. Vukani Primary School in Cross Roads is where the Port of Cape Town employees chose to volunteer their time in partnership with Beautiful Gate South Africa. Over 70 volunteers participated in a gardening project, repairs and painting of the school library and clean-up, paving and landscaping of the yard. The Leap School and Waumbe Youth Development Centre also received donations from the port that included desk top computers and tuition assistance for Maths and Science. In Mossel Bay a team from the port volunteered time at eViwe Community Centre, an after-care centre that caters for kids after school in KwaNonqaba, where TNPA painted and donated chairs for the computer lab, as well as heaters and floor mats to get the youngsters through the colder season. Port of East London volunteers stepped in at various local institutions. At Daily Bread Mission Mount Coke in King Williams Town, which caters for 60 children, TNPA donated 20 mattresses and cleaned up the mission grounds. At Pefferville Primary School in Duncan Village, 100 pairs of school shoes were donated and ablution facilities were cleaned to better serve the school’s 1385 learners. East London port employees also visited Mpundu Old Age Centre in Alice, where they donated mattresses, blankets and a food hamper. At Good Samaritan Child and Youth Care Centre in Mdantsane, the Port of East London donated school shoes, food hampers and sports equipment, while at Funukwazi Training Centre in Mdantsane the TNPA East London team built a wheelchair ramp and repaired and painted ablution facilities, doors and classroom floors. Port of East London employees also helped out alongside representatives of Transnet Group at Qunu Junior Primary School in Mthatha’s OR Tambo Inland District, which was turned into a modern school with state-of-the-art computer and biology laboratories after Mandela’s visit there in 1996. The school, on the other side of a hill from Qunu, also happens to be the first primary school Mandela himself attended at the age of seven. During his schooldays, it consisted of a single room. The Transnet volunteers painted doors, ablution facilities and classrooms, and helped to clear and recycle as well as repair fencing. The team from TNPA’s Lighthouse and Navigational Systems (LNS) division spent the day at Friends Day Centre – a care, activity and therapy centre in Maitland for children and adults with severe to profound intellectual and physical disabilities, including Cerebral Palsy, Spina Bifida and Epilepsy. Employees painted a classroom and spent time with learners and staff. LNS also donated t-shirts to two homeless shelters in Cape Town, The Haven Napier Street and The Haven District Six. Port of Richards Bay employees will observe Mandela Day on Thursday, 19 July, by spending time with the children at Bit by Bit Creche in Ndondwane, which caters for kids of one to four years old. Port of Saldanha employees will volunteer their time and resources in Langebaan on Friday, 20 July, cleaning, painting and repairing damaged equipment at the children’s park in the area. TNPA will also donate concrete picnic benches to be used at the facility. Volunteers from the Port of Ngqura will also support their chosen initiative on Friday, 20 July.